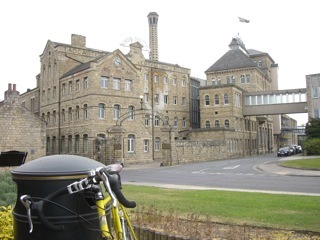 We met at John Smiths Brewery in Tadcaster for the coach trip down to Bristol. 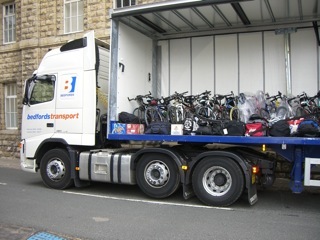 The bikes were loaded on the back of a curtain sider artic, donated for the weekend by Bedfords Transport. Whilst the rest of the country (world) was gripped by Royal Wedding fever, we made ready for the journey south to the starting point of the Meek's 200 Miles. We met at 6.00 for a photo call outside the hotel and then we were off northbound after stopping briefly for more photos outside Hammer Out's offices in Thornbury. Another 6.00 start from Stoke on Trent and the ride would take us north to Manchester then north east over the Pennines to Andrea's Gift's base in Bingley. With two major climbs behind us, we descended through Denholme down to Bingley and on to the finish at the Bankfield Hotel. It was a brilliant weekend, the stiff constant headwind only added to the overwhelming sense of achievement felt at the end. Well done to everyone involved and thanks for all the flapjack and bananas. Click on "View Details" on the little maps for more info on speeds, elevation and cadence. Hope you enjoy the video.